Create Embellish Adore: Happy Easter (Monday)!!! 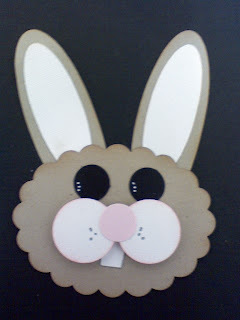 So on Thursday night, I got out my punches, and friend who has a cricut, arrived and we were in Bunny making mode! I had a few ideas that I wanted to use, but she does all the math!! We got busy and by 11 pm we had 20 bunnies punched/cut, sponged, eyes and noses defined, and assembled! Some of the feet are done in this pictured, and some are not. I did the others with pink.. but forgot my pictures since I was so excited to give them away yesterday. 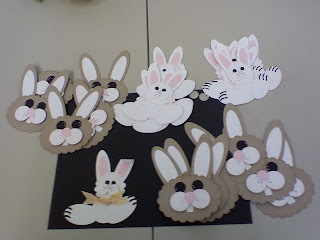 Here is an example of each of them - I put the entire bunny on cards, and then the bunny faces on baskets that I made. 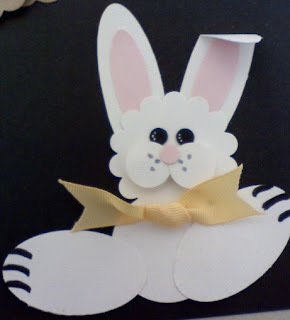 I attached different ribbon to the bunny bodies, in which I coordinated the cardstock with. I believe they were a hit. Or atleast the candy in the baskets were!! I like them, and honestly have to clean the table off to see if I even have a sample left for the box! !